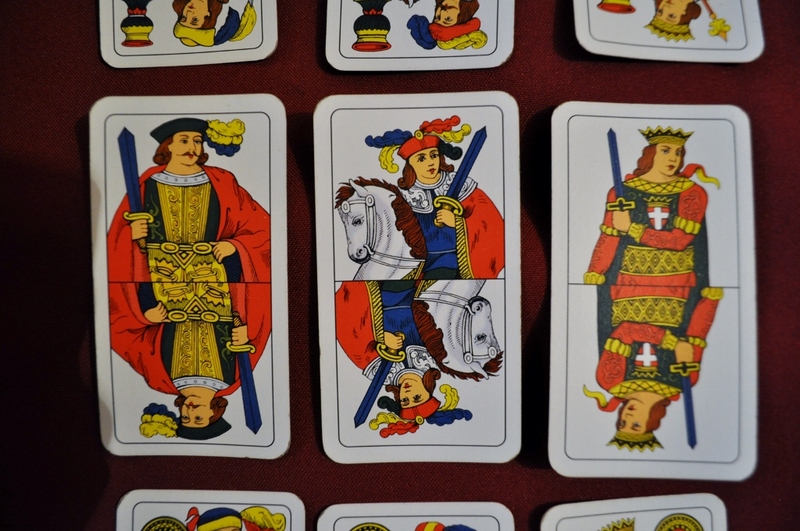 A quick way to earn an Italian’s respect is to tell them you know how to play “Tresette.” A favorite among old men and commonly played during the holiday festivities, this is not just a card game. It’s a fierce competition in which the smallest error, be it a memory lapse or bad assumption, can result in endless agony. I love cards and board games, just ask my neighbor growing up. We spent all our rainy days battling in games of Gin Rummy, Monopoly, and Poker (remember what life was like for a kid before the internet?!?!?). So when Eugenio offered to teach me how to play a classic Italian card game, I naturally jumped at the offer. But before I could learn the game, I had to learn the cards. Should be simple, right? We aren’t dealing with clubs, diamonds, hearts, and spades anymore. Oh no, that would have been too easy. 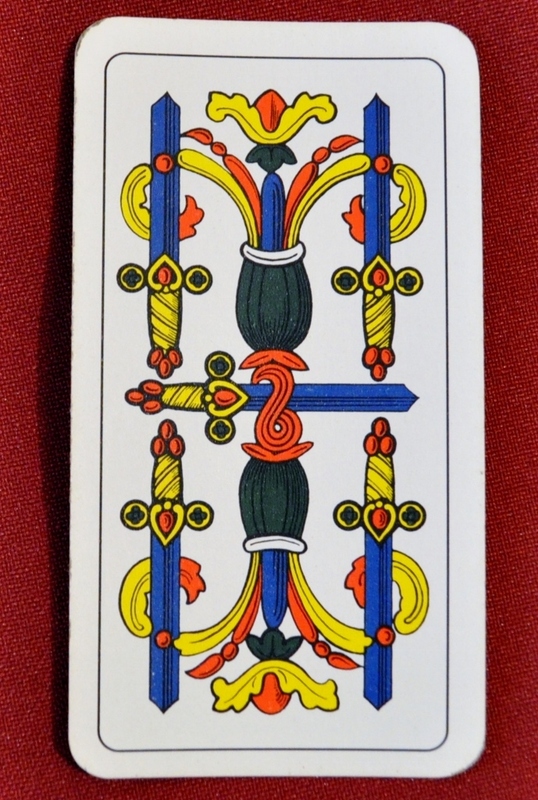 We’ve got the Italian deck which has Denaro (coins), Bastone (clubs/sticks), Spade (swords), and Coppe (cups). And you know how our decks of cards give you the hint in the upper right and lower left corners? The number and symbol so that you don’t need to see the whole card to know what you’re holding? Yeah, you can forget about those too. Non-existent. The card makers love to mess with you by adding all sorts of random décor, just to distract you from being able to determine the value of the card. The ace of swords comes complete with a flying angel and ribbons while the ace of coins would makes his debut on the breast of an eagle. Um, what? There are 4 clearly visible swords plus an additional horizontal sword in the center. But what are those other half-swords popping out of the two vases??!?!? Are they plants or swords??!?! Why on earth are they blue?!?!?! I can’t tell you how many times I thought I was playing the 7 of swords when really it was this damn 5. So rather than 52 cards, there are only 40. Ten to each suit. Ace through 7 and then the Italian equivalent of Jack, Queen and King…which I’ve affectionately nicknamed Page Boy, Horse Man, and King. The Italians just call them “8, 9, and 10.” While the horse man is easy to identify since he’s got his four-legged friend, the page boy and king are confusing. Hint: you have to take a look at their headgear. Only the king wears a crown, the page boys are stuck with feathers. This entry was posted on August 19, 2013 by Katie. It was filed under Italy, Lifestyle & Hobby and was tagged with Italian Card Games, Italian Pastimes, life in Italy, Tresette. Sign me up again! Miss you so much! rate. This is very important ranking factor. up, so having reasonably low bounce rate is important for improving your rankings naturally.